celeb…(can you guess? )…Vanessa Hudgens posted the same styled photo on her Instagram. Only then did this teeth whitening brand capture my eye as she claimed it was the reason behind her white teeth. As I do class myself as an avid tea drinker, I think that this has had a not-so-good effect on my teeth over time which added to list of things I'm very self-conscious over and have been wanting to change. 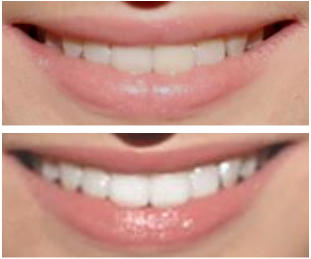 However, getting your teeth whitened professionally isn't cheap, so when I came across this natural way of achieving white teeth, I was eager to give it a go. 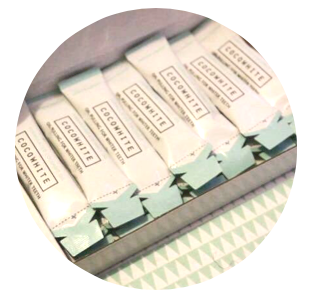 There is a choice of three flavours; minty fresh, vanilla and lemon. I ordered the minty fresh flavour, which was subtle but pleasant, and certainly made the texture of the oil more appealing and took away any taste of coconut (which I realllyyyyy can’t stand). In one box you get 14 sachets that will last two weeks. On the packaging, they recommend that you swirl the oil for 5 to 15 minutes before brushing your teeth at night - I usually swirled for the full 15 minutes. The oil itself is solid in the sachet so it took a minute or so of swirling for it to become liquid, which I'm not going to lie, did make me gag much due to the texture (I’m really bad when it comes to the textures of some things - coconut oil being one). After a few nights of doing it this way, I then realised you can melt the coconut oil by warming it up in your hands, or in my case, putting it under your bed covers with the electric blanket on (what? xD) - something that they do recommend if the texture bothers you. Though I would say buying coconut oil from the superstore and swirling it would achieve the exact same results and would be much cheaper, I would recommend Coco White for the portion size, the guidelines and the taste. However, despite saying that, I have contradicted myself as my mum ordered quite a bit of coconut oil (that doesn't taste of coconut - what a find!!!) so I can continue with oil swirling without spending about £40 each month. Overall I found my experience with Coco White to be surprisingly successful and can be shown by seeing how whiter my teeth have become in only two weeks, I am surprised by the results! 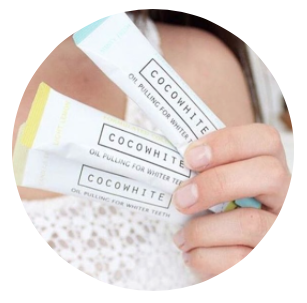 Oil-pulling is actually an ancient technique used for removing toxins from the whole body, and particularly within the mouth, and is said to promote outstanding oral health. My teeth have felt amazingly clean and now that I'm finished the course, I will miss this part of my nightly routine but hope to continue swirling with regular coconut oil and on top of that, I imagine the results further down the line will be even more impressive. I hope that some of you have found this helpful. 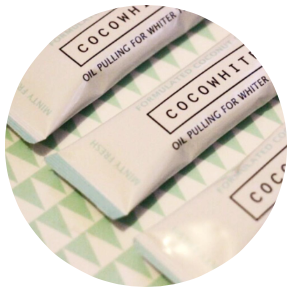 Let me know your opinions of oil pulling, and if you have tried this natural teeth whitening trick, how did it work for you?